1. Season steak generously with salt and pepper. 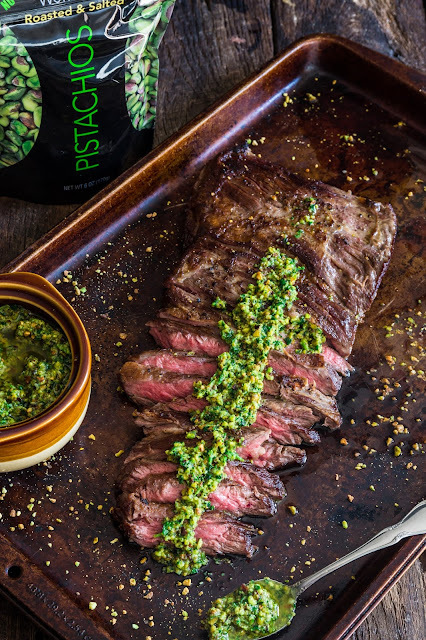 Let it stand at room temperature for 30 minutes, while you prepare the chimichurri sauce. 2. Combine the parsley, garlic, Wonderful Pistachios, red wine vinegar, salt, freshly ground pepper and ¼ cup olive oil in a food processor. Pulse until well blended but still coarse. Remove to a small bowl and stir in the remaining olive oil and red pepper flakes. Reserve at room temperature for up to 6 hours, or refrigerate if not using within that time frame. 3. Light a charcoal or gas grill or preheat a cast iron pan on the stove, over medium heat, until smoking. Grill the skirt steak over high heat (or pan fry over medium high heat) until the meat is charred on the outside, about 2-3 minutes per side for rare or until the desired temperature. Transfer to a cutting board and let it rest for 10 minutes. 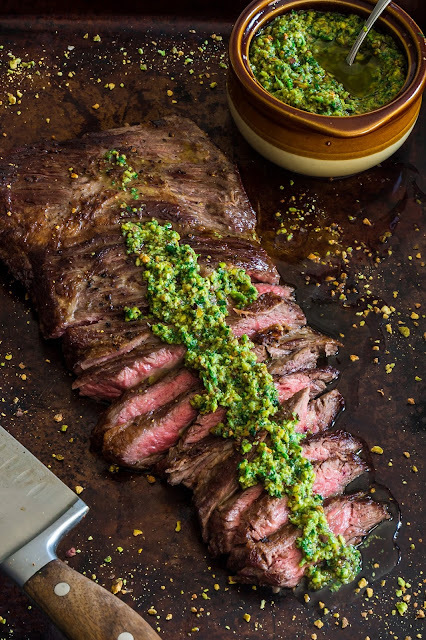 Then, slice it across the grain and serve immediately, with the pistachio chimichurri sauce on the side!